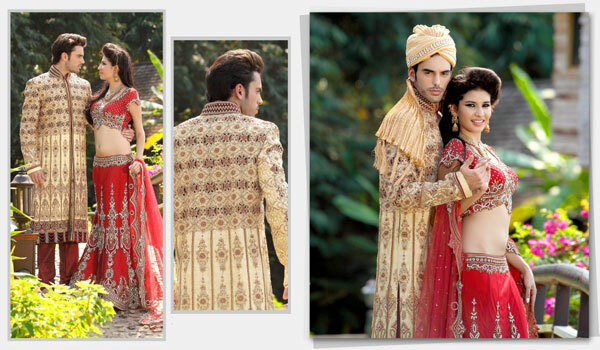 Every groom dreams of having a wonderful stylish wedding dressing attires on their special day of their life. Now a days groom makes extra efforts to carefully choose glamorous dressing attires that can draws praise and admiration on the auspicious occasion including wedding reception. This year, Sherwani trend has caught the fancy of the fashion world like never before and has stage comeback with a bang. There are a variety of traditional wedding attires like Kurtas, Suits and Achkans etc available to man to choose from for their wedding day wearing, but traditional wedding Sherwani remains very special. Sherwani is a knee length jacket featuring Nehru collar and front opening with decorated buttons. They are made of different materials such as pleated fabric, cotton, zardozi, crepes, and woven silk etc. Fitted usually with Jodhpuri to add grace, Sherwanis are often is adorned with antique diamonds, spectacular crystals, colorful stones, mirror work, cutdana, jari, jardosy, beads, kundans and hand embroidery etc to make them very special. Traditional wedding Sherwani is made in variety of vibrant colors that includes maroon, gold, silver, peach, brown, creamy and mauves etc and often comes with matching churidar pyjama, stole or a pagri. Typically they have self design zari and sequins work all over the base that gives them a rich ethnic texture. We have done commercial photo shoots for hundreds of our clients who are manufacturers of traditional wedding Sherwanis. Check out our Sherwani for men portfolio page.